Located conveniently close to Venice – a major tourist hotspot of Italy – Caorle is an extremely appealing alternative for holidaymakers in search of Italian vacations less their inherent hustle. However, tourists should keep in mind that peak season months draw huge flows of visitors to Caorle which is, in the other hand, a symptom of the increasing popularity of this seaside resort. The beaches in Caorle are the ones to make the resort worth visiting, though there are certain elements which do not only render Caorle unique among its counterparts, but also bring a picturesque touch to this town. The lagoon-like structure of Caorle and the so-called casoni (fishermen’s traditional houses) are just two of such features. It was not until recently that Caorle turned into a worldwide popular tourist destination, the history of this town being pegged out by its allegiance to Venice. There aren’t many landmarks to remind newcomers of the history of the place, though the Cathedral of St. Stephen (Cattedrale di Santo Stefano) and the Church of the Blessed Virgin of the Angel (Santuario della Madonna dell'Angelo) do stand out as marks of the reasonably significant presence of the city within the political and religious life of Italy. The bottom line is the nowadays identity of Caorle is delineated by the tourist profile of the town, the remaining element to call forth the generally rather mild past of Caorle referring to its fishermen – and to their casoni – who actually capitalize upon this traditional activity of Caorle and wrap it up as appealingly as possible in view of making their way through to the future by selling their way of life as a mark of Caorle. Accommodation solutions are yielded by a fairly manifold range of establishments. Caorle is fitted both with fours star hotels and camping sites – just to cite the extremes in terms of comfort and budget requirements – and with everything in between these two types of sleeping venues. Thus, more than 200 hotels and some 9 camping sites conjoin, together with the apartments for rent, into a tourist infrastructure welcoming visitors who are in search of unforgettable moments on the shore of the Adriatic Sea. Caorle does not have a gastronomic identity proper, though it does excel in alluring visitors with spectacular fish dishes and with specialties the chief ingredients of which refer to seafood. Yet, culinary delights of Italian origin are displayed at each and every eating venue in Caorle. Pizza and pasta joints are also well worth a visit, given they are the closest thing to the idea of symbol of gastronomic Italy. Wines are held in great respect in Caorle, and tourists are advised to at least sample some of the generous oenological offer of Italian wines once in Caorle. 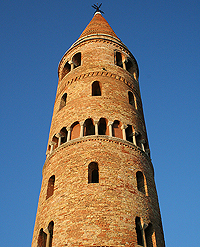 The historic center of Caorle is not as vast enough and as replete with landmarks as to keep tourists busy all day long. However, its main highlights refer to the Cathedral of St. Stephen (Cattedrale di Santo Stefano) and to the Church of the Blessed Virgin of the Angel (Santuario della Madonna dell'Angelo), two religious establishments with undeniable intrinsic value. The museum pertaining to the cathedral, namely, the Caorle Museum (Il Museo del Duomo di Caorle) is also worth visiting. All in all, its beaches are the ones which keep Caorle breathing from a tourist point of view, and it is no overstatement to say the sandy stretches in Caorle indeed stand out as some of the top beaches in Italy, enhancing the tourist rating both of Caorle proper and of the entire Province of Veneto. The beaches in Caorle are well fitted in view of enabling plenty of activities and of making sunbathing as comfortable and as enjoyable as possible. Yet, one might also want to diversify their stay in Caorle, which is why the resort makes available a series of other leisure opportunities. They refer to the amazing Aquafollie water park, to Lunapark, to trips to the Falconera area of Caorle – which is, indeed, a charming place worth discovering since its main highlight refers to the so-called Isola dei Casoni – to nearby trips (most advisable, by boat) to Venice, Lido di Jesolo, Eraclea, Duna Verde or, why not, to Bibione. Biking is also a pleasant way of discovering the surroundings of Caorle, whereas scuba diving opportunities lure the more adventurous tourists. The nearby Golf Pra’ delle Torri also complements the leisure opportunities in Caorle. While exploring the center of Caorle at night, tourist might come across some fine nightlife venues, though Caorle does not excel with respect to this feature. Scogliera Viva – attend Caorle’s most striking and creative event in order to see how the cliffs come alive in the hands of skilled artists.